The regiment was in defensive position in the vicinity of Gressenich and Langerwehe, Germany. The 1st Bn, southwest of Luchem, was in contact with the enemy by patrol only. 2nd Bn was in assembly area in the vicinity of Nothberg, and 3rd Bn was in assembly area in the vicinity of Weisweiler. 1st Bn maintained in contact, while 2nd and 3rd Bns remained in assembly areas. 1st Bn attacked at 0900 hours, and seized Luchem. The town was occupied and prepared for all around defense. 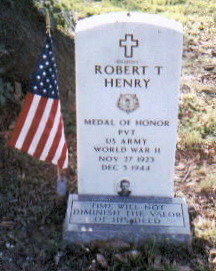 Robert T. Henry (November 27, 1923 - December 3, 1944) was a United States Army soldier and a recipient of the United States military's highest decoration — the Medal of Honor — for his actions in World War II. Henry joined the Army from his birth place of Greenville, Mississippi in April 1943, and by December 3, 1944 was serving as a private in the 16th Infantry Regiment, 1st Infantry Division. On that day, at Luchem, Germany, he single-handedly charged a German machine gun nest which was preventing the advance of his platoon. Although he was killed before reaching the nest, his attack provided a distraction which enabled his comrades to destroy the position. 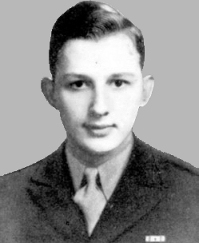 For this action, he was posthumously awarded the Medal of Honor six months later, on June 12, 1945. Henry, aged 21 at his death, was buried at Greenville Cemetery in his hometown of Greenville, Mississippi. The Henry Kaserne in Munich was named in his honor. Near Luchem, Germany, he volunteered to attempt the destruction of a nest of 5 enemy machine guns located in a bunker 150 yards to the flank which had stopped the advance of his platoon. Stripping off his pack, overshoes, helmet, and overcoat, he sprinted alone with his rifle and hand grenades across the open terrain toward the enemy emplacement. Before he had gone half the distance he was hit by a burst of machine gun fire. Dropping his rifle, he continued to stagger forward until he fell mortally wounded only 10 yards from the enemy emplacement. His single-handed attack forced the enemy to leave the machine guns. During this break in hostile fire the platoon moved forward and overran the position. Pvt. Henry, by his gallantry and intrepidity and utter disregard for his own life, enabled his company to reach its objective, capturing this key defense and 70 German prisoners. 1st Bn improved positions in Luchem, while the 2nd and 3rd Bns remained in assembly areas. WITH U.S. FORCES, Dec. 4. Four German townships were captured by the U.S. First Army yesterday in daring night attacks. Inden, south of Jülich, which has been the scene of bitter fighting for five days, was cleared of the enemy early in the morning, and the Americans, taking advantage of the surprise factor, moved forward quickly to occupy Lucherberg and Luchem. South-west of Düren other troops captured Brandenberg, bringing forward elements to within 2,000 yards of the Roer River. Troops of the U.S. Ninth Army advanced along the Roer to the outskirts of Jülich, further strengthening the Allied hold on the western bank of the river. Lucherberg and Luchem occupy important points on each side of the Adolf Hitler Highway, and their capture has rendered that road useless to the enemy. The Americans launched their attack against Inden at 11 p.m., and the Germans, caught unprepared, withdrew, leaving the Americans in control of a bridge over the Inde River. Two other bridges had been destroyed. At 9 a.m. forward troops had reached Lucherberg, 2,000 yards to the south-east, but the Germans were offering stiffer resistance. After a few hours of street fighting, the Americans were cut off, and the Germans called on them to surrender. But the Americans took to the cellars, and called down their artillery on their own positions. The Germans were caught unawares by the manoeuvre, and suffered heavy casualties in the shelling. Immediately the barrage lifted, the Americans emerged from the cellars and cleared up the town. By nightfall all positions had been consolidated, despite counter-attacks. Instead of capturing the American unit, the Germans lost 117 prisoners. The regiment, plus attachments, was relieved from positions in the vicinity of Gressenich - Langerwehe, Germany, and assigned the mission of relieving the 60th Inf., 9th Division, in the V Corps zone, vicinity of Roetgen, Germany. The sector was on the defensive, and the regiment operated directly under the CG, V Corps. As sector commander the CO 16th Infantry had, in addition to normal attachments, operational control of the 102 Cav Group. Movement to the new positions commenced at 0800 hours. The regiment closed in new positions at 1700 hours, and the relief of the 60th Infantry was completed at 2200 hrs, with the 1st Bn, 16th Inf. relieving the 2nd Bn, 60th Inf. ; the 2nd Bn, 16th Inf., relieving the Inf. Defensive positions were improved, and counterattack plans were drawn up in case of enemy assault. Positions were consolidated and improved. Enemy action was very light. Co. B, 16th Inf., moved to new positions on the left flank of the sector, due to sector boundary being extended. Regiment remained in position. 5th Field Artillery attached in support of the regiment. No change. Enemy action light. Regiment, less 2nd Bn, relieved from positions by the 309th Infantry, 78th Division, and moved to a rest area in the vicinity of Verviers, Belgium, and Herve, Belgium, for a ten-day period of rest and training. The 2nd Bn, 16th Inf., remained in position, to be relieved on 13 December. Regiment, less 2nd Bn, in rest area . Rehabilitation of troops was instituted and plans made for period of training. 2nd Bn completed movement to rest area. Shower facilities were made available to all personnel, and pass privileges instituted. Rest and rehabilitation carried on, with ceremonies held for presentation of Bronze Stars, Purple Hearts, and Distinguished unit badges. The regiment was alerted for immediate movement as a result of a large enemy breakthrough. All passes and leaves were cancelled, and preparations made for movement. Regiment, plus attachments, moved from rest area vicinity Verviers and Herve to positions vicinity of Robertville, Belgium, with the mission of defending to the southwest. Contact patrols gained contact with adjacent units, and the battalions prepared and occupied defensive positions. The 3rd Bn repulsed enemy attacks, and counterattacked to gain limited objectives, preparing new defensive positions. 2nd Bn seized and occupied the town of Weismes, and repelled enemy attempts at infiltration. The 1st Bn occupied new reserve positions southeast and southwest of Bruyères, with Co. A relieving Co. ?. 2nd Bn extended lines to include more 1st Bn ground, without incident. The 3rd Bn repelled enemy attempts to infiltrate their positions, and extensive mine fields were laid in front of all positions. Additional mines laid, and defensive positions improved. Co. F was moved to occupy high ground, and all battalions laid additional mines and barbed wire. Enemy attempts to infiltrate were repulsed by the 3rd Bn. Additional mines and wire were laid, and the 2nd Bn repelled an attack of infantry supported by tanks. Co. K, from reserve, relieved Co L. 2nd Bn resisted enemy attempt to take an outpost, and repelled an attack of approximately 40 infantry. Additional mines laid. 2nd Bn repulsed enemy forces attempting to infiltrate. Enemy outpost positions were attacked, and additional wire and mines laid. Additional wire and mines laid, and enemy patrols were engaged in the vicinity of Faymonville. Contact was maintained with the enemy by patrol, and additional mines were laid. Extensive patrolling conducted, and contact maintained with enemy. Heavy harassing fire maintained by us throughout the period. Defensive positions were improved and several enemy outposts were destroyed. Co. L relieved Co. I, and Co. I moved to reserve position in the vicinity of Weywertz. Additional mines were laid. Enemy activity was light.